Offer thanks to the Lord for the many blessings that have been granted in the U.S. in the leaders appointed by the Lord in this present administration. Pray for Sarah Sanders, that God will encourage her and continue to use her as a leader in this nation. “That’s why he’s there and I think he has done a tremendous job in supporting a lot of the things that people of faith really care about,” Sanders said…. Despite concerns by evangelicals over US policy in Syria, evangelicals have been more than satisfied with President Trump during his first two years in office…. Thank you Lord, that you raised up President Trump for your service, to give America a reprieve. Bless the President and Executive branch personnel faithfully serving. Please expose betrayers and deep state radicals in the government. Bless all public servants performing your will and chasten those who are rebellious. Bring us back to yourself O Lord God. You are an amazing woman, and I am so grateful God choose you. I also believe that President Trump is the chosen one for our nation today. What would we do without him as are president? I pray for your strength to stand up to that bias media. Don’t you ever back down, not ever. All of us are pulling for you. Lord, keep Sarah in your loving arms at all time. Continue to give her wisdom, as she speaks the truth for us to hear. Bless her each and every day, and keep her safe. thank you Lord, and in your name we pray. Thank you for your honesty and transparancy in your office and life. Your faith and integrity do show through. Praying for your steadfastness and protection. Re Karen Pence: I have had a desire in to pray for Karen Pence by email through her executive assistant. Sarah, if you or anyone who picks up this comment could connect me with Karen Pence his executive assistant. Please do so . THANK YOU – 4 Prayer purposes only. GOD BLESS SARAH. THANK YOU LORD FOR PUTTING HER AS HIS HELPER. BLESS OUR PRESIDENT & GIVE HIM FAVOR WITH AMERICA TONIGHT & GIVE HIM WISDOM TO SAY WHAT YOU WOULD HAVE HIM SAY. LET HIS WORDS BE YOURS!!BLESSINGS. Doing a great job Sarah, stand strong and don’t back down. for speaking for the administration. And I love you father too. Thanks for being so honest. 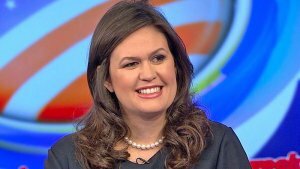 You are doing a great job as Press Secretary for President Trump. Hail to the Chief !!! Doing fantastic job and I believe God is pleased with your faithfulness. Praying 🙏 for you and President Trump that He May give you protection and wisdom as you serve Him. God bless you!!! May God bless and protect Sarah and her family as well as President Trump, his entire family and his administration. May God give them his Wisdom and His favor. I pray for a special hedge of protection and favor as President Trump gives his State of the Union Address tonight, and that he will be anointed by the Holy Spirit. I think Sarah Sanders is a first class lady. We should be thankfull for her role in government.